"Crescendo Cove is a satiric, episodic drama, focussed on the Bolt family as they battle serial killers, computer hackers, multiple personality disorder, crippling addictions and more." Crescendo Cove by Greg Weir is a parody novel updated every few days. Crescendo Cove has not been tagged yet. Help others find Crescendo Cove by tagging it! 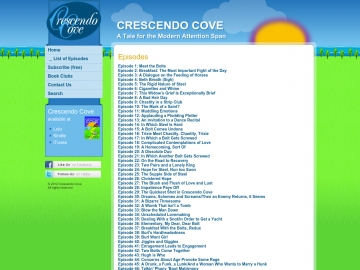 Crescendo Cove has not been reviewed yet. Crescendo Cove has not been recommended yet.